It’s exciting to be engaged. Everyone you know is congratulating you, friends are popping champagne, and you feel “on top of the world.” Now you get to plan a wedding, and of course we’re all aware that while it can be loads of fun, it can also be a tad overwhelming. I mean, you need to pick a date, figure out that pesky guest list and who gets a plus-one (wouldn’t it be easier if everyone were just already married?) and hopefully you don’t have drama, but I’ve witnessed some crazy things as a bridesmaid. (My first piece of advice: do not un-invite your mother unless you have a really good reason). As someone who’s about to get married, I have plenty of fresh memories from the wedding planning process. These are the tips I’ve found most useful. Some originally came from my mom or the internet (full disclosure, the tips toward the end are outsourced from people who’ve actually been down the aisle) but most of this advice is extrapolated from my personal experience. Hopefully, it’ll help the next bride who’s planning a wedding in our region. First, let’s talk about jewelry. Men: Get some trusted guidance when picking out the ring. Before wedding planning even begins, there needs to be a successful proposal. If you don’t know where to begin, ask her girlfriends for insight. Chances are high they’ll be ecstatic to help (my best friend was gladly willing to send my fiancé a million screenshots of rings that were my taste). What kind of cut does your woman like? (Princess, round, pear, etc.) Does she imagine a sparkly band or plain band? Rose gold or white gold? Remember, you’ll have to get wedding rings too, so that might impact your budget. Bonus tip: Once you purchase the engagement ring, hide it somewhere safe where she won’t be able to find it. That sounds obvious, but I’ve heard horror stories about rings being thrown away on accident. (Don’t hide it in her room in an open bag of Ghirardelli’s chocolates!) Figure out where you’ll hide the ring before you buy it. Brides: Once you’re engaged, immediately get your future husband involved in the planning process. It’ll be more fun this way, and you won’t have to feel like you’re planning a wedding by yourself. Give him access to your Google spreadsheet so he can enter his family members’ names and addresses. Have him come to meetings with photographers, florists, DJs and other vendors so you can both make sure there’s a good vibe. Ask him to help address save-the-dates and invitations (or at least have him lick the envelops if his handwriting is hieroglyphic). And fellas – you may just want to sit on the sidelines so your bride can have “everything she wants,” but the truth is she’ll appreciate your opinions. There’s a lot of decision-making throughout the planning process and it’s nice to have your perspective. Make a budget early on. Before you even pick a date, figure out who’s contributing to the cause. Are the bride’s parents paying for everything, or a significant chunk? Are the groom’s parents willing to help out? Or is the couple financing their own day? Don’t assume you’re getting a large check, then sign a bunch of contracts and regret it later. (A friend of mine did this and lost a pretty big deposit on a caterer). Once you have a rough estimate of what everyone is willing to contribute, you’ll have a better idea of how much you can spend on each vendor. Money can be the most stressful part about planning a wedding, so the more honest and accurate you are about your budget in the beginning, the easier it will be to meet with vendors in your price range (and ultimately just focus on preparing for marriage). Within that budget, figure out what details are most important to you. Do you have your heart set on a certain venue? Is your ideal DJ or live band on the pricey side? Set aside the funds for what matters to you the most, and be OK with cutting back on other things. For instance, maybe you have a talented friend take your engagement photos so you have a little more to spend on fresh flower bouquets, or maybe you have fake flowers but spring for the late-night snacks. It’s all about priorities. (My fiancé and I decided it was important to allocate funds toward an open bar, since our ceremony is definitely going to be more than an hour long. Plus, we’re Irish). Even if you have a big budget, you can still make these decisions on a smaller scale. Maybe you only choose one upcharged hors d’oeuvre out of your three selections, or you choose short-form videography – such as your wedding day edited down to 20 minutes – instead of an 8-hour package. Your vendors should be able to work with you to reach the best outcome for your tastes and budget. Make an effort to attend some bridal expos. Personally, I love bridal expos because of the raffles and door prizes (I’ve been lucky with this in the past!). But they’re also a great way to meet local vendors face-to-face and garner ideas for your wedding day. Oftentimes, vendors offer promotions or discounts if you book their services on-site or in the near future, so it doesn’t hurt to do a little bit of research beforehand about who’s going to be there. If nothing else, you’ll probably get to try some delicious hors d’oeuvres, which furthers my conclusion that bridal expos are the best. Bonus: The Galena Bridal Fair is Saturday, Feb. 16, from 11 a.m.-2 p.m. at Turner Hall, 115 S. Bench St., Galena. Featuring about 35 vendors, each will host a drawing. Brides can pre-register at thegalenabridalfair.com for free admission or else pay $5 at the door. Start touring venues right away, and once you find one book your DJ and photographer ASAP. I couldn’t believe how many Saturdays were unavailable when my fiancé and I started looking at venues. Some places were almost fully booked two years into the future, and even Friday dates were slim pickings. Fortunately, we were willing to be flexible with our date, which helped us secure a venue we loved. It may feel like a lot of pressure, but once you have a venue, find your photographer and DJ sooner rather than later. Unlike other vendors, they can only do one wedding per day. You’ll definitely want a band or DJ who brings the party you envision while keeping your timeline in mind. And we all know the photos of your special day still remain once the flowers die and the cake is consumed. It’s exciting and relieving to have these vendors locked in. When choosing your vendors, don’t be afraid to meet with multiple people. The Chicagoland region has so many options for photographers, DJs, florists, caterers, cake bakers, hair stylists and videographers, not to mention the dozens of shops for formal wear and jewelry. If there’s a vendor you’re interested in, make an appointment to see, No. 1, if they can accomplish your vision, and, No. 2, if your personalities click. Each photographer has their own unique style; every caterer has a different menu. Some vendors are more serious throughout the planning process, while others are more laid-back. You should feel comfortable asking your vendors a million questions; they’re your go-to, trusted advisors throughout the planning process. And yes, it does feel crummy when you can’t hire everyone and need to send “rejection emails,” but you’re allowed to inquire and choose who you want to work with. A hair/makeup trial? Absolutely. A free glass of wine while touring a venue? Don’t mind if I do. This especially applies when searching for a caterer – they should be willing to overwhelm you with food during your tasting (my fiancé and I had leftovers for a week!). Once you sign on the dotted line, you’re locked into spending a lot of money. So, let people prove to you why they’re the best choice. Take note of who follows up. Once you reach out to a few vendors and have your initial meetings, see who’s actually getting back to you. I’m not saying they need to reply immediately to every email or text message, especially since business hours vary in the wedding industry. But, if you’re having trouble getting in touch with someone and you haven’t even signed a contract yet, that’s a red flag. Make sure to work with reliable people who put you at ease. Go with your gut and don’t look back. If you’re generally indecisive, it’s time for an intervention. I was this way when searching for a dress – I genuinely loved a bunch of options and couldn’t decide. Then I starting searching for problems in everything I tried on, which just made it harder to choose. Narrow down your options, ask your questions, recognize there aren’t any “bad” choices by now, and make a decision. (The time is right if you’re going nuts, along with everyone around you). Once you make a decision, don’t doubt yourself. Do not Google the other options you could have gone with. Once I finally picked a dress, I realized how silly it was that I spent so much time stressing out about it. If you start backtracking, rely on your fiancé to calm you down and provide perspective. The day is about getting married, remember? One month to go? Delegate. This sage advice comes from my mom. If there’s a task you can pawn off, this is the perfect time to ask your bridesmaids for help. See if one of them can make the party bus playlist or day-of emergency kit. Or better yet, cut items off your to-do list. I know you wanted to clean your ring again and make little gift baskets for your out-of-town guests, but it’s really OK if you don’t (says my mom). 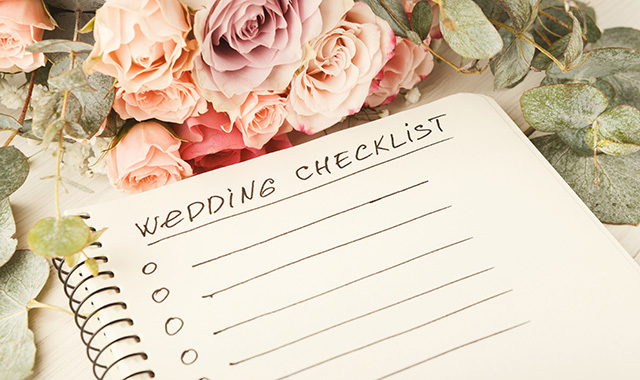 Just make sure the important things are taken care of, like finalizing the seating chart and confirming all of the last-minute details with your vendors. Also, it helps to schedule calendar alerts for your final payments so you don’t accidently miss any deadlines. Have a point person to answer any last-minute questions. The best man, the maid of honor or your parents can help to answer your guests’ questions about where the venue is in relation to the church, or when the cocktail hour begins, etc., etc. I might just give my cellphone to my sister (the maid of honor) at some point… we’ll see. When feeling overwhelmed, just remember what the day is all about. My fiancé and I talk about our post-wedding future all the time, which helps me remember why it’s all worth it. We all have that relative who’s judgmental about the food, the colors, or your decision to play your favorite explicit song from your college days. Take the pressure off by remembering that you don’t need to plan the best wedding your guests have ever been to; you literally just need to show up and say “I do” in front of witnesses. Once that part is over, you’re married! Live in the moment and enjoy the first few hours of your married life. This entry was posted on Tuesday, January 29th, 2019 at 12:00 pm	and is filed under Northwest Woman, Top Posts. You can follow any responses to this entry through the RSS 2.0 feed. Both comments and pings are currently closed.